I always suspected that eventually my being the oldest of six children in a Catholic family combined with that one year (kindergarten) of Catholic school education, would probably come in handy someday. 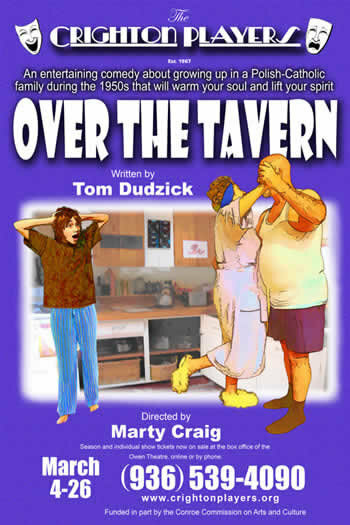 That day turned out to be last Sunday when I had the pleasure of attending the Crighton Players’ amusing production of Tom Dudzick’s Over the Tavern at Conroe’s Owen Theatre. Crisply and sensitively directed here by Marty Craig, the play is based on the author’s own childhood in Buffalo, New York, and is the first work of a trilogy by Mr. Dudzick. With a clever depiction of living room, kitchen and bedroom areas spread across the stage, the bright and cheery 1950’s-style set (designer, Ron Craig) provides the upstairs apartment setting of a Catholic family named Pazinski. They live above the tavern owned and operated by Chet Pazinski (Dan Jackson). He is the gruff and distant father of four children who feel no meaningful connection to their dad. There is sweet daughter, Annie (Cassidy Perkins), just entering adolescence with budding interest in boys, snack foods and her own appearance. She has her eyes on the busboy at Chef’s Italian Restaurant, and as her mother wisely observes, “There’s something about a man in uniform.” Her handsome big brother, Eddie (Jordan McLaughlin) is sixteen and feeling his oats with the aid of a stash of girlie magazines. He wants to be sure he knows the difference between venial and mortal sins lest his soul be in danger of eternal damnation. With teenaged angst, McLaughlin is quite convincing in the role. Another brother, young Georgie, is mentally challenged with indications of Tourette Syndrome that show up at the most inconvenient (and hilarious) times. 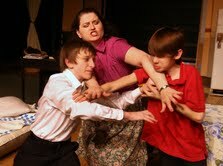 Young Caleb Glass carries off that role brilliantly and appears to have a great time doing it. That word brilliant must now bring my attention to the real star of this show, Justin Perkins, in the role of young Rudy Pazinski. This thirteen year-old lad gives an astonishing performance, at once both sweetly touching as well as hilarious. His articulate mastery of extensive dialogue appeared flawless, and his comic timing was no less. 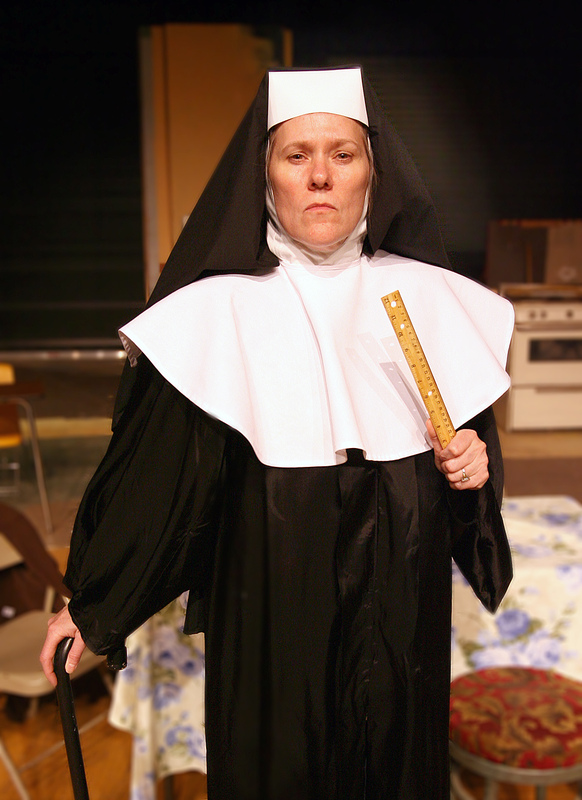 Rudy is a freethinking boy being tutored in his Catechism by Sister Clarissa (Sharon Grindel), an imposing and tough-as-nails nun at St. Casimir’s School. He concedes to Sr. Clarissa that, “I think God likes us, but if he loved us, why would he let so many bad things happen?” It almost seemed a timely question as we watch the current earthquake/tsunami devastation in Japan. Meanwhile Rudy makes frequent amusing solo visits to the chapel seeking guidance as he talks to Jesus about his problems with both his father and the nun. The father relationship is key here with all the children. Mr. Jackson brings all the bluster of a busy dad whose often-angry nature keeps the kids at a distance. We see hints of his softer side, as on a night when the children are in bed and he coaxes his wife to dance with him in the living room. I would like to have seen additional glimpses of his gentler side as the loud and constant gruffness was disquieting, especially in Act One. Happily, as I had hoped, Act Two brings out his long-hidden warmth to unite the family. As for Mrs. Pazinski, Susan K. Morrow brings wonderful warmth of her own to the role of the patient mother and housewife, Ellen. Whether dealing with a handicapped youngster, a temperamental husband, a daughter who insists on a beehive hairdo, or a son that can’t get along with a nun, Morrow’s performance brings rich understanding to each scene and every member of the family. 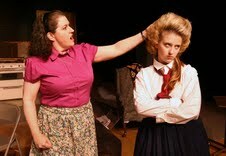 Also adding to the authenticity of the production are the fine ’50’s period costumes of Lynn Peverill. Speaking of scenes, don’t miss the uproarious one when Sr. Clarissa comes to visit the family. I was particularly fascinated when she presents young Georgie with a Miraculous Medal. While not strictly a Catholic devotion (I know several non-Catholics who always wear one), I have continually worn my medal to this day ever since childhood. To learn of its mystery you must search elsewhere as I am not writing a religious column. Now I know heart attacks are serious business, but trust me, this show has one that is great fun, especially when young Georgie decides to mimic the exasperated nun’s heart attack after she is rushed off in an ambulance when Rudy announces he would like to transfer to public school. But the poignant scene when Rudy makes peace with her at the hospital by presenting a homemade rosary made of Trix cereal nuggets is a memorable one. He even returns the mended ruler she had broken in a fit of rage, but she sweetly counters, “Keep it as a war memento.” Young Mr. Perkins is darling with her, and his performance is an enchantment. Mr. Pazinski also visits sister at the hospital, and it is there that the truly wise old nun reveals her years of guilt over having led his alcoholic father toward the abusive discipline that now haunts this next generation. But all ends happily, and perhaps Rudy was correct when sharing with Sr. Clarissa his belief that “God just wants us to have fun.” If that is true, surely “Over the Tavern,” must have been part of God’s plan. This entry was posted in Miscellaneous Reviews, The Courier Columns, Theater Reviews and tagged Conroe, Entertainment, Houston, Reviews, theatre. Bookmark the permalink.